When I arrived at TWLER (The Worlds Largest Electronics Retailer), it was clear that the digital business teams were sad, sad, sad, sad, sad, sad, sad, sad and very sad. After a couple weeks of reading through the ATG codebase I was also sad. Sad enough that I seriously considered searching for a new job because the code was such a mess. A massive mess. We were supposed to fix this? Write an RFP for a new thing such as adding a marketplace to the browse and commerce portions of the site. Seek bids from the three IT integrators that were approved by IT. Receive bids back with one IT integrator, we’ll call them A, as the project manager and the other two IT integrators vying for delivery. Bids start at $1M and only go up. For something like a marketplace, $27M was closer to the mark. Sign the contract to start the work. Within a week, 20 onshore coordinators and 100 offshore developers magically appear and start wreaking havoc on the shared codebase. 9-19 months later, severely over budget, something resembling a marketplace appears and is attempted to merge with the existing headstream, using a branch that started 9-19 months ago. Chaos ensues as every other project delivered between that time is broken and the IT integrator’s teams start fighting amongst themselves. After another two months, victory is declared, something buggy and barely working is deployed, the contract is finished and the 120 people disappear within a week. Bug fixes are now the responsibility of the shadow IT team mentioned above, to re-engage the IT integrators to fix all the problems they created needs a new RFP. Repeat this process until spirit is broken. There’s really only one solution to this problem (besides hiring a whole new business team) and that is to start delivering on your promises. That’s what we set out to do, but the environment made it unduly difficult for us. As the first team of architects to work for TWLER.com, we started mapping out the current situation and planning for the future. 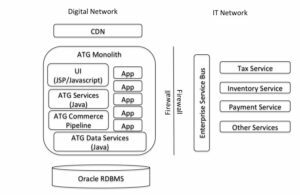 ATG was the base eCommerce engine and Oracle the RDBMS. Some attempt to provide enterprise services had been undertaken in the past and tax, inventory and payment had all been removed from the ATG codebase and were now called as enterprise services. There were a number of other integrations but these were the main services that caused issues in the digital world due to the disconnect in service levels that were present in the TWLER (The Worlds Largest Electronics Retailer) environment. It’s worth mapping out the organizational structure to start to understand the additional frictions present in TWLER’s attempts to run a digital eCommerce system. The Digital teams were separated out from the IT teams many years ago and had remained in that state. Digital was viewed as unimportant since stores drove the revenue, Dotcom was a sideline play, even in 2010. Digital was run like a business and software development was matrixed out to the IT team. The Digital team had taken over its own operations at some point because the IT teams were unable to support 24×7 operations in their model. There were dotted lines between the Digital VP Operations and the IT VP Digital Portfolio, as well as between the Digital Chief Architect and IT Senior Director Digital. The Business VPs in the Digital team drove the business projects, with input from the wider enterprise business teams in marketing and merchandising. Between the Digital Business and IT was a Business Relationship Manager, who was supposed to translate the business asks into IT requirements. The IT requirements were then shipped off to an enterprise integrator to spin up a new team and deliver the projects. Your success varies. In addition, internally to the Digital team was an innovation team that had spun up a completely separate Mobile site on ATG, and managed the Mobile Apps. This team was quite clear in their goals to replace all of Dotcom with their mobile site at some point in the future. So now I knew that there were two teams with the goal to replace the main www.TWLER.com eCommerce site. Finally, there was the Senior Director of Digital in the IT team who was mainly responsible for hiring Accenture to manage projects, and WiPro/TCS to execute projects. This was a very important role as someone had to manage our vendor partners and ensure quality delivery (since I can’t get sarcasm across in writing, read this last line with as much sarcasm as you can imagine). This Senior Director also had plans to rewrite the Dotcom site, he had not gained support from the Digital VPs because they were extraordinarily unhappy with the quantity and quality delivered thus far. To recap, in the first six months at TWLER I learned that there were at least three teams who felt they were responsible for rewriting TWLER.com. Additionally, the software development on the ATG platform was spread across multiple divisions, multiple vendors and multiple countries. All features were added by project teams who appeared when the money started, and vanished the second the money stopped, all support fell to the Digital VP of Operations. This VP was forced to contend with the mess of code and integrations that 1000s of developers were contributing to every day. I finally understood why she had moved forward with hiring her own team to rewrite TWLER.com. We owned the codebase but lacked capital, in year one we had $7M to get the team started. By the time 2011 rolled around, that amount was cut back to $3.5M. The TWLER.com (The Worlds Largest Electronics Retailer) architecture team started with the chief architect and five additional people, myself for high scale Java applications and NoSQL, a TWLER consultant/architect that had lived through the entire life of TWLER.com and recently converted to an employee, a second TWLER employee architect specializing in APIs and Product catalogs, a cloud infrastructure architect, and another systems thinking high scale Java architect. With a six person team, we tasked ourselves with converting TWLER.com from its massive monolithic state to a new not yet known state. What we decided early, or was decided for us, was that we were going to evolve out of the current state to a future state. It was decided for us by two constraints, not enough capital to build a new system separately and run the current system, and the stipulation that business must continue unaffected by our efforts. At this time revenue was around $1.5 billion. There were multiple projects that we started that first year: infrastructure automation of a modern build infrastructure deployed in a cloud, cloud based outage site, distributed product catalog and QA automation. There was one more task assigned to me as exploratory which was to look into the ATG Ant build and see if there was any way of automating it with a dependency management framework. The selection of these projects was built around the strategy to establish a modern engineering infrastructure that we could then leverage with all our future work. Having a robust Continuous Integration environment, universally available Git and SVN version control systems, artifact repository, wiki, task management and user authentication system would allow us to move quickly in the future. The distributed product catalog was built off the theory that to exit ATG, the basis of that plan required a new distributed product catalog outside of the ATG system. QA automation was the final card needed to move past six week manual release testing windows so that we could run thousands of regression tests in hours and speed up the release process. My main project was QA automation, which was a successful disaster. Successful in that we were able to automate many of the manual test cases using Selenium and JBehave, but that the UI was so inconsistently rendered that all fields had to be accessed directly with XPath, and even then the pages sometimes rendered differently causing the tests to fail. Additionally, we were unable to setup test data in a consistent manner causing tests to fail randomly when underlying data was changed or deleted. In reality it was still better than the manual tests, but we struggled to maintain even 80% test coverage for more than a few days. The most interesting work for me was delving into the ANT build file for ATG. I had plenty of experience with ANT in its heyday in the late 90s and early 2000s. I thought I knew ANT pretty well, but when faced with the 20+ ANT files that made up the build of 14 separate ATG applications, I had met my match. In my spare time I started tracing through the ANT files, determining how variables were setup up and finding the main path through the files. I had to diagram out the actual workings of the files as there was multiple instances of recursion occurring within the build process. My goal was to figure out how to convert the build over to Maven, which I’m sure many of you hate, but bringing in dependency management and forcing a standard file system layout we felt were the most important considerations. After a few weeks, it was my estimate that it would probably take a couple people 2-3 months to convert the ATG build from ANT to Maven, and that we could tackle it in smaller pieces by starting with the 13 builds that were not the main TWLER.com site. We shelved this idea for the time being, but when we did get back to it a year later, my estimate proved exceedingly optimistic. In 2010, the cloud was not new but it was ignored by large companies, particularly in non-technology focused segments such as retail. While it is clear now, at the time large retailers had not yet awakened to the new reality that a company’s prowess in software might decide its future outcomes. As an example, in my first year at TWLER (The Worlds Largest Electronics Retailer), store sales during December were not going well. Since many retailers make 50% or more of their annual sales in November and December, this spelled impending disaster. Traffic was down in stores and the company’s reaction was to propose that the digital channel stop its free shipping offer. This clearly showed the company leadership’s inability to fathom online shopping. The logic would be that if a customer could buy it online and have it shipped for free, they would not go to a TWLER store. Seems reasonable, but if the customer is shopping online and we did not offer free shipping, they would simply click to the next store, probably Amazon, and buy their electronics from them with free shipping. This customer was not going to a TWLER store that Holiday, ever. We were actually saving sales for the company, it just wasn’t understood. A minor digression on the state of the ATG system is necessary to understand what we were dealing with. The original ATG system was built in 2003, at the time it was an excellent decision for a mid-sized retailer to build its first ecommerce engine. But over time, and numerous one-off projects, the codebase had morphed, intertwined and been generally neglected and abused. As an example, one ongoing project when I arrived was to widen the product detail page (PDP) and move the Add To Cart button from the left side of the page to the right side. This seemed fairly innocuous, but it took six months and well over one million dollars to accomplish this task. This seems ridiculous to me so as an architect, I dug into why this was happening. This sounds bad enough, but the executable for ATG was in the GB range, built as an ear, with a special Ant file which only one or two people understood (more on this later). It was necessary to build and run the entire ear to determine if the page changes worked since the JSP code was so intertwined with the server side code. However, it was impossible to actually run this ear on a developer’s machine because it also required a full working copy of the Oracle database. No one had actually figured out how to make all these things work yet on a single desktop or laptop machine. Instead, there was one shared development server for the entire Dotcom division. This server was a large Unix box but still too small to serve thousands of developers trying to build and run the ATG codebase. This server alone routinely failed due to lack of disk space and not enough CPU. But, it was the only place to build and run code you had worked on in your IDE, so everyone had to deal with it. If you weren’t crying yet, the next step was to actually deploy the code to the staging environment (skipping the integration environment altogether) because the reality was the front end code only worked if it could access the Internet as there were so many externally downloaded components to the page. Even though you deployed the code to the shared developer environment, you couldn’t actually run it there. The staging build happened once every night. To sum this up, the normal front end development cycle is change some code, save it locally, have it automatically picked up by your running app server and test it. This cycle time should be in the seconds range so you can work quickly and efficiently through all the little tweaks necessary to make a UI page look good and work as expected. The cycle at TWLER was change some code, save it locally, do your best to make sure the page compiled, check in the code, push to your developer environment, do your best to check it compiled, wait for the overnight stage push (go home), come back the next morning and see if the change worked in stage (assuming the push didn’t fail, which it often did). Instead of a cycle time of seconds for each code change, the cycle time was one day. One entire 24 hour day! Did I mention zero automated regression tests? Now I bet you think that $1M was cheap. In fact, I still don’t know how anyone actually got any work done in these conditions, but I do know that the churn in the front end development team was enormous. I’ve fielded many questions lately on how I am governing and reviewing the architectures of Target to make sure they conform to enterprise standards. This is a common question asked of Architecture teams. After all, many people believe the main responsibility of Enterprise Architecture is governance. But governance is the last thing I like to discuss about what Architects actually do. Governance or discussions about being governed means that I’ve actually failed to deliver a simple, clear and implementable technology strategy. If I’ve clearly communicated a technology strategy with desired, but not necessarily mandated, system structure, implementation stacks and supporting platforms, than engineers will happily fit into the architecture to deliver their systems. Answer #2: Architects define the types of systems and their boundaries that are possible within an organization. When we discuss technology strategy my goals are to deliver composeable systems which meet current and future business demands. The key to this statement is that we will meet unknown future demands without rebuilding our current systems, or having to build large new systems. There’s an assumption here that your future unknown demands are extensions of your current capabilities. If you’re headed into new business models, you’ll likely need a few new systems. In today’s world, unknown future demands are presented every day, and the expectation is that they can be delivered in days, weeks or months, not years. For an organization to stay relevant with their consumers, a technology strategy must meet this demand for speed above all else. To achieve speed at scale the systems are constrained to deliver one thing only. A system is generally composed of services (or microservices if you like) that deliver either data or process through an API. The only governance that architects do is to ensure that data or process is comprehensive and unique. Data systems are comprehensive when they are complete for an organization, and take all changes generated throughout the organization. Process systems are comprehensive when they contain the basic services necessary to complete a process, and can be flexibly orchestrated by any entity within the organization. Done correctly, an organization is composed of hundreds of APIs that each implement a narrow set of functionality. Systems don’t continue to expand to take on more business demands and processes. Actually, systems never want to do this, people expand systems to become more important in their organizations. Governance falls out of strategy, the only governance necessary is ensuring teams don’t construct competing data systems or alternative processes. If the current systems don’t meet their needs, fix them by doing the work and submitting a pull request. That’s also much easier than standing up a new system and engineers generally like this solution. People ask this question because they truly don’t understand. They are really asking “Are architects necessary?” They ask this question because they have rarely seen value from the architects they’ve seen in the past. This is the sad reality of much of the architecture world, enterprise architecture in particular. My opinion on why architecture has devolved to a place where many companies are eliminating the practice altogether is simple. Most architects in the upper echelons of companies were never software engineers. Why this is important and is a point I harp on continuously, is that if you haven’t spent your 10 years writing code and building and running systems with higher and higher business complexity, you cannot do the first thing architects should do. Answer #1: Architects create the environment for engineering culture to thrive. To create an engineering-centric culture, you have to have been an engineer. You have to have a few large scale Agile/DevOps systems under your belt. You have to understand what drives and motivates engineers that want to work on six person teams tackling the toughest problems facing enterprises. You need to feel it in your gut when one person on the team is a hack and can’t pull their weight and your management won’t address the problem. You must have found the rock and through sheer force of will, pushed it up the hill, leading in such a way that the rest of the team helps push it along with you. If you haven’t done these things over the course of years, you haven’t been a software engineer. Architects that understand how engineers want to work, spend all of their time and energy creating an environment where hard problems are solved, new solutions are found, and everyone sleeps well at night. Architects make decisions based on whether engineer’s will understand them and choose them regardless of what else is available. Architects also create the constraints that allow engineers to solve their problems quickly. With the near infinite array of tools, frameworks and packages available, to remain economically competitive, enterprises need to limit the scope of technology in some way. Make no mistake, architects select and limit technologies, but only those that involve large expenditures. If a technology selection will cost a company in excess of $1M for licenses, subscriptions or maintenance over a five year lifespan, architects should be involved. Architects essentially act as the aggregated will of the engineers. Architects are there to make engineer’s lives easier. Architects in effect are servants of both engineers, and the enterprise and walk the fine line that brings the maximum value to both. We had another fun and exciting rendition of Open Source North in June earlier this year (2016). It’s a conference that eventually will be recognized as the premier technology event of the year in the Twin Cities. Well, that’s my prediction at least. I had a great time and got to give my presentation/group discussion on the state of Architecture in the Midwest and how the practice needs to be redefined. Architecture means nothing these days, Enterprise Architect in it’s traditional form is dying, and Engineers are taking over the space once occupied by Architects. Why have an architect if you can have an engineer do the same job and deliver the working software as well?